Tickets $5.00 available day of show. 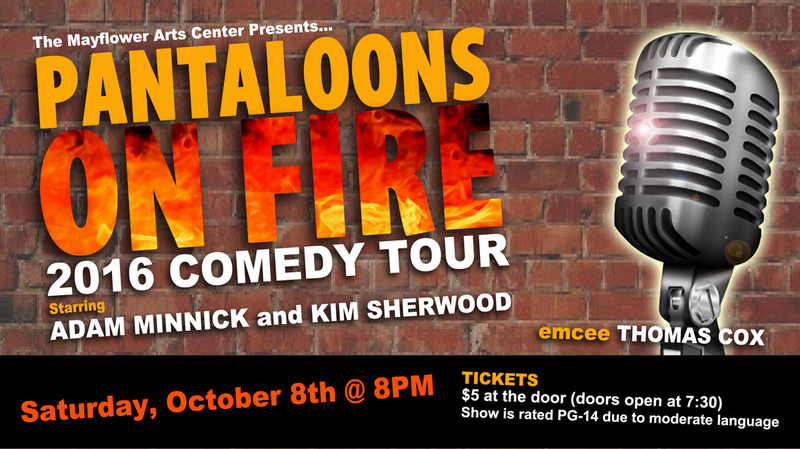 Join us Saturday, October 8, 2016 as we host another great night of stand-up at the Mayflower with Pantaloons On Fire 2016 Comedy Tour, featuring the comedy sketch act of Adam Minnick and Kim E. Sherwood. The event is hosted by Thomas Cox and is rated PG-14 for moderate language. Adam Minnick is a comedian, writer, and producer. He has worked at comedy venues across US cities, such as Cincinnati, Chicago and Atlanta, as well as abroad in Ireland and Australia. Adam combines family stories with his whimsical take on everyday life to deliver a clean and intelligent act. He has a laid back persona, yet maintains the ability to be both subtle and in-your-face. Adam's unique view on life is due in no small part to having spent much of his youth in the small town of Napoleon, Ohio and the booming metropolis of Perth, Australia. His stand-up debut at Xavier University's annual "Mr. Muskie" male pageant ended in disappointment, yet his perseverance and drive have since afforded him opportunities to spread laughter across the world. In addition to working regularly at major clubs and appearing at comedy festivals like Laughfest and the Cincinnati Brew Ha-Ha, Adam has become a published Children's Author with his first book, "The Adventures Of My Crazy Uncle Adam", which has sold domestically and internationally. As a kid, Kim Sherwood heard, “Never hide your sense of humor from the world” from his grandmother. A promise he is committed to keep. At the University of Michigan, Kim was a writer and cast member of the campuses’ sketch comedy troupe, “The Big Show,“ which allowed him to get a taste of performing for over 1,200 people per show. After college, Kim found himself moving from Grand Rapids, Michigan to Cincinnati, Ohio, where he rediscovered comedy through improvisation, and producing Improvapalooza, Cincinnati’s first improvisational comedy festival. During production of the festival, Kim founded the award winning improvisation comedy troupe, Wits End, which helped him create mental spontaneity, and an overwhelming stage presence. It was only a matter of time before stand-up comedy found its way into Kim’s life. After only a couple of open mics, word got around quickly and he was hired sight unseen, in local comedy clubs. Since then, Kim has been rapidly making a name for himself with a personable, likable, comedy style that speaks from experience. Kim’s clean comedy has entertained many corporations in and around the Cincinnati area. He has been a regular and house MC at the Funny Bone in Newport, KY and is also the producer of the One Hot Mess podcast. You may see him in the new James Franco movie, The Long Home. Born into a military family, Thomas was raised and has lived literally coast-to-coast with several southern and mid-western points between. Thomas is a single parent of three children, and has been a family mediator for 30 years. 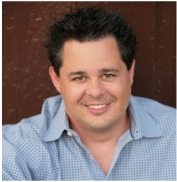 Having once won the "Funniest Person in Northern Kentucky" and the comedy competition for "Ageless Entertainers" he offers his experience and perspective on kids today and family life in the 21st century. Performance and venue information is available by calling 937-552-5848. Make it a complete evening with dinner at any of Troy's local restaurants, many of which are within walking distance to The Mayflower Arts Center. For a list of local, tasty establishments, click here.